Home » Android application » artificial intelligence » email » less mail » Robin Labs » Artificial Intelligence and Email- A Good Idea? It could probably be reasoned that anyone over the age of say, twenty-one could use a personal assistant. Truthfully, the same could be said for people under that bracket as well, but it doesn’t count because they’ve already got assistants- they’re called parents, duh! For the rest of us however, it’s pretty safe to say that mom and dad aren’t calling to remind us about deadlines and responsibilities (darn it!). And unless you’ve reached the status where you’re actually afforded an assistant, managing our day-to-day lives is really a solo act, isn’t it? For now, maybe. 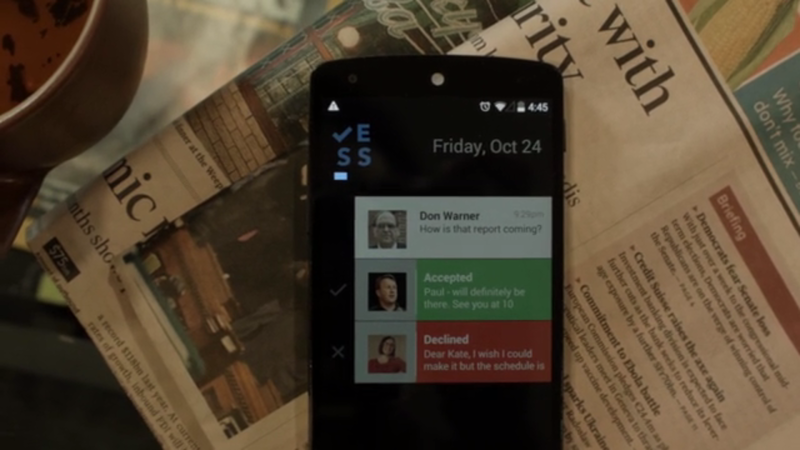 A Palo-Alto based company by the name of Robin Labs has announced the onset of a new Android application called Less.Mail. The premise is that the App utilizes artificial intelligence to help you manage and respond to your emails. An intriguing video released by the company shows a user going about his everyday tasks as Less.Mail voice alerts and reads incoming messages aloud. The user then issues a simple command, such as “No, thanks- but please decline politely”. Less.Mail proceeds to draft a polite rejection email, which it presents to the user for approval before issuing the final response. Both the potential and potential drawbacks are clearly seen here. If the AI is as advanced as Robin Labs has made it appear to be, it could be a huge convenience for professionals and students everywhere. As it’s been demonstrated in the video, being able to respond to your emails while en route to your destination would be an obvious time saver. Of course, the flip side to that equation is equally known to anyone who has ever been a victim of auto-correct’s well-intentioned, but ultimately flawed services. At the end of the day, could a machine really be trusted to accurately convey your messages? Especially when those messages are addressed to, oh, I don’t know- your boss? Despite that sobering comparison, Robin Labs is confident that Less.Mail will work optimally. The company’s CEO Ilya Eckstein has reasoned that “Approximately 80% of our emails are routine”, which clearly indicates that the program can adequately adapt to and generate accurate responses due to recurring themes. If you’re a skeptic, or Elon Musk, hang back while others test the accuracy of Less.Mail’s AI first. The reviews will surely pour in soon enough!